Stampin' Up! UK Demonstrator - Teri Pocock: Winter Wonderland - "Oh Christmas Tree"
The Winter Wonderland Challenge Blog launches today! 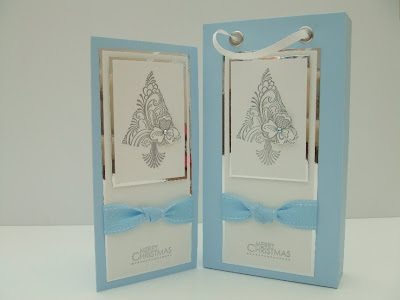 Pop over and have a look at the lovely DT cards for this week's theme of 'Oh Christmas Tree'. There is some pretty candy on offer too for our first week's 'winner'. I used a new stamp set called Scandinavian Season from Stampin' UP! for the main image. This is such a pretty modern Christmas Tree and looks lovely when heat embossed with silver powder. The products I have used are all Stampin' UP! apart from the silver mirri card which is from Joanna Sheen, the brushed silver eyelets which are WRMK and the little gems which are from my supplies. I used 2 sheets of A4 cardstock, but trimmed 2.5cm off the long side as it was a bit too long for what I wanted. On each piece of cardstock, score the two long sides and one short side(bottom) all at 4cm. Cut along the two vertical score lines on the short side up to the 4cm horizontal scoreline. Measure for placement and add the eyelets at the top of each cardstock piece now, while the cardstock is still flat. On the back piece put glue onto the right side of the two corner tabs that were created by the cuts (above) and then fold them in, pressing the longer middle tab up to them to form the bottom of the back half of the gift bag. You then need to do the same for the front piece, but before you do, decorate it as you require first - it's easier than trying to stick things on later. I tend to use a strong, tacky PVA type glue for my bags, but you could just as easily use the strong, red sticky strip. Wow is all i can say tho this little combo........never liked that stamp before and now I want it....hubby will not be pleased!!!!!! What a beautiful post. Your work is wonderful and a real inspiration. WOW!!! Absolutely gorgeous!!! you did a beautiful job! I LOVE this set and you've really made it shine, it's cool and crisp! I just adore your bag and card...this was what inspired me to use blue and silver.. just love the combo. The mirror board is to die for.. just so beautiful against the white. Very Beautiful & Elegant cards. The tree is penny black and I have inked it up with two colours and just heat embossed with clear powder, I then just put little tiny jem stickers onto it, I think they are by woodware! This looks absolutely great, very elegant. Hiya Teri, this card and gift bag are adorable! Can't beat a bit of mirri card to add some elegance to a project can you - soooo classy.